black eye pencil that have Long-lasting action and water resistant color. 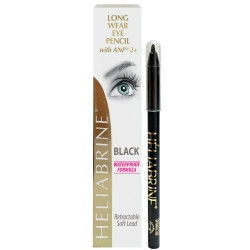 An incredible black eye pencil that intensifies the look of your eyes. Long-lasting water resistant color. Silky-soft creamy texture for an easy application. Retractable lead, cannot be sharpened. To open the lead, turn the opposite side. Apply to the upper and/or lower eyelash line.Keep away from heat. Used to beautify the eye and prevent eyelashes.